The Val d’Abondance has always cultivated a certain mindset with respect to its large neighbours, the Faucigny and Geneva regions. Lodged in a lost corner between Lake Geneva and the upper Rhône river, its relative isolation encouraged a particular political culture for the small group of people living far from the major Alpine routes. Its adaptation was not without heated debates. In a struggle between preservation and development, local identity and outreach to the world, this is the story of a rather unusual valley. Burnt at the stake to fill the coffers of the community… A terrible story from the early 1500s sheds light on the unusual customs of a valley already firmly decided to maintain its privileges and freedoms at any cost. What a bizarre notion ! But the idea that the border units is self evident in the Val d’Abondance, which has closer contacts with Switzerland and the Valais canton than with Thonon and France. For reasons having to do with both its history and geography. Over the centuries in this outlying area, people, ideas and goods have never ceased to cross over the mountains. Does the Val d’Abondance seem exotic to someone from the Valais canton ? What stands out for someone arriving from Switzerland in this neighbouring, yet foreign valley ? Here are the highly personal impressions during a step-by-step discovery of similarities and differences. In the 1800s, very few writers ever found themselves in the Val d’Abondance. That makes the writings of Francis Wey in 1865 all the more interesting. The local prefect wanted to present the new French department to the public and requested that the writer and archivist travel throughout the Haute-Savoie department, « the most intriguing region in France and perhaps in all of Europe« . A lively and instructive text that the author claims to have written with no prior instructions. Excerpts. Photographer Pierre Vallet reveals hidden facets of the Val d’Abondance whose archetypical character generally tends to elicit stereotypes. The images are fleeting delights, intricate, fine and nuanced, taken at the precise moment when most mere mortals forget to capture the passing of the day and to savour the flow of time itself. There are a number of itineraries off the beaten trail to discover the culture and heritage of the valley. Suggestions for a trip. Almost 23 years ago, the Abondance cheese was awarded a PDO (protected designation of origin). And quite a battle it was ! The debates opposed certain traditional views and commercial interests. At issue was the extension of the production zone beyond the Haut-Chablais area. Today, the Abondance cheese is an outstanding product among cheeses from the Savoy. …on a hill, sometimes painted blue and studded with finely worked galleries. The large, wooden farm houses in the Val d’Abondance are strikingly original. The architecture, often comprising two family units, has not been observed anywhere else in the Alps and manifests the close relations between the occupants and their territory. That spirit of creativity is needed now to devise new answers to solve the issues confronting residential buildings in the new millennium. 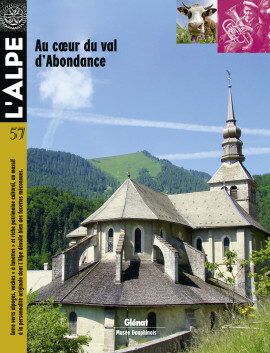 The inhabitants of the Val d’Abondance are avid singers and musicians, but are not always aware of the full scope of their musical heritage that includes polyphonic singing, fanfares, accordions, choruses and folklore borrowed from the Swiss neighbours. A quick look at the musical traditions of the valley.